Take a tour of the weapons and blood used for Alien: Covenant! Adam Savage has treated us to yet another fantastic behind-the-scenes tour of the Alien: Covenant movie set! This time, he takes us on a tour of the various weapons and bloods used throughout the film. What's interesting to note is the black blood used for some of the Aliens - perhaps the Neomorphs bleed black? Alternatively it could also simply be the Black Goo process when it infects the Humanoid Engineer race. We're not sure yet if the black blood is acidic or not either. Check out the video and as always, let us know what you think below! Check out Adam's other video as well, where he tours the interior of the Alien: Covenant Juggernaut set with Ridley Scott! 22 Fan responses to Take a tour of the weapons and blood used for Alien: Covenant! I do not understand why in the beginning of the saga alien and prometheus the military do not possess laser weapons and effective armor in exoskeleton like ironman or other to face the xenomorphs or any other extraterrestrial threat. We are in the future and not in the 1980s or early 2000 !!! Je ne comprends pas pourquoi dans au début de la saga alien et prométheus les militaires ne possèdent pas d'armes laser et des armures efficaces en exosquelette comme ironman ou autre pour affronter les xenomorphs ou tout autre menace extraterrestre. Nous sommes dans les futur et pas dans les années 1980 ou début 2000 !!! Laser based weapons are in development here in reality, and oddly enough will be field-practical in about 20 years. However, projectile-based weapons will always usually be less expensive, and easier to fix in the field if something goes wrong. Also, with projectiles you have a variety of choices as to types of bullets, which is not the case with a laser-based weapon. Laser-based weapons are also ones that will require training as they differ from projectile based weapons in many ways that can indirectly endanger the operator, and are actually considerably more devastating. Contrary to what science fiction wants you to think, if you get shot with a weapons-grade laser, your odds of survival are very slim, and laser wounds will bleed profusely. Firing a projectile-based weapon aboard a starship creates problems, but firing a weapons-grade laser aboard a starship can become the stuff of nightmares very quickly. Ironman type armor, well, to be blunt would be insanely expensive, even mass-produced and with only a fraction of the capabilities seen on film. It would also require a great deal of training and experience to use properly and safely, especially aboard a starship. Maintaining it would be also very expensive and quite an involved process. I think lasers would just feel out of place in this series. I think the lasers BWW mentions are beams that aren't seen? That wouldn't make for good cinema. The Projectile Explosive Fire-arm has not changed much in over 50 years if its not broke, dont fix it. These Fire-arms are Practical, Cheap and Reliable. We do have case-less ammunition like the Pulse Riffles use, but they are not as practical and prone to overheating the barrel and jamming. I think Finally Ridley Scott has got this Bang on the Money, the Ships, the Weapons are all very much what i think we would still be using in 75-100 years. Alien the ship would only look about 70% what a Actual Space Ship from Earth would in over 100 years, Prometheus again the same. One is to Advanced Looking and the Other a Bit Basic as far as VDU and Computer/Console Controls. Alien Covenant has got it 100% Spot on. Laser Technology is here now, we could make Laser Weapons 100%, they however would have a limited capacity as far as Firing Time and would require a Huge Battery System which means only say Jeep Mounted Lasers that dont last long would be viable at the moment. The Problem with Laser Guns, and Gauss Guns is simply the Power Required as they would run off Electricity and the amount of Energy needed is beyond our means at the moment as far as making them a viable portable Weapon. However on Ships, or Large Tanks or Weapons Platforms they could be used, Rail Guns included but at the moment they offer little advantage over conventional Explosive Projectile Fire Arms. A Truck/Weapons Platform with a .50 BMG Projectile that has multiple barrels with a 2500 RPM would be just as effective than the best Laser Weapon we can deploy in the same size Truck includes Power Requirements. Light Sabres are Cool... but a Razor Sharp Katana is still a effective Weapon, for most cases. I will make a Prediction to say its very very unlikely we will ever (not for 200 years) a Personnel Laser Weapon, unless we get something like a Blaster. Once we can invent Power Sources that can be mobile and supply the power to operate a Weaponized Laser i would say that instead we would use this Power to Power a kind of Gauss/Rail Device instead that would fire BB's or Bullet Shape Projectiles. So in the future Guns will not change much, just that explosive component will be replaced by a different propulsion that would use electricity. Laser Weapons would eventually be used but only as far as on Warships, and Defense Platforms where they would replace Anti-Air Fire, and Anti Missile Defense Systems. I can see the need for a Sci-Fi to have Futuristic Weapons, but Ridley Scott is trying to go for more Realistic Weapons here. Prometheus had more Advanced Guns because it was a State of the Art Ship that was using some of Weylands State of the Art Military Weaponry.... which seemed to be Normal Projectile but Gauss Propelled Weapons... which is what i see the future of Fire Arms being. If you look at it as a Posh Taxi Firm... then nearly 22 BMW M3's are better than having just the ONE Veyron. We need to remember this is not a Military Mission, and indeed Lope in his Viral Video mentioned that he feels a 6 Team Security Force is maybe a bit short. We dont know how more advanced these Guns are. I would be willing to bet in 50 years time we wont see a drastic change in design of our Assault Riffles. The only Advancements i can see that will not effect the Aesthetic Look are. More Efficient Propellant that could increase Speed and Power by 25-33% Or remain the same but allow for 20% more Ammunition per standard Magazine Size. Then you would have a Superior Fire-arm to the Standard we use today. lol we had this conversation a few months ago. 136 years, the same principle and mechanics may be in use but something like this would be more believable. Wow! thats awesome, one of those rifles is going into service with the Australian Army, thats a big leap from the old 72mm SLR and a bit more advanced than the steyr which is currently in use, the SLR is still used for ceremony especially ANZAC day, some ceremonies use the steyr. Totally agree, we do have some Futuristic Weapons as far as Looks. But its mainly the Rail, and Stock that makes these guns look more Futuristic but in terms of Military Application the Aesthetic Look of a Weapon is not as important to how it handles as far as size, weight distribution and materials. And so if the Stock and Rail of a Weapon is a Tried and Tested Design for Comfort, Ease of Use, Strength and Light Weight then its something that wont change much. But this would maybe still not be as Futuristic as some would hope.. But the above Camerons Avatar Weapon is not that different to the Marines Pulse Riffle in Aliens. Thanx for posting this Chris. I've added some screen grabs in a thread too. Does anyone else thing those burnt looking bodies don't look any bigger than humans? Hmmm I totally agree where is the technology that matches walter. An ironman type armour would cost a tiny amount compared with a walter even if they only had one or a few of them on board it would add realism and pure logic. Prometheus got away with the guns as they kind of didnt have any! 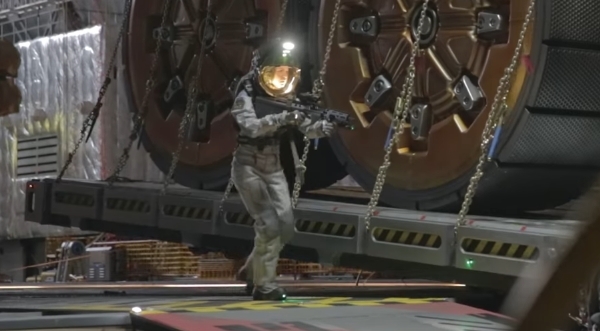 And that hand gun at the end used on the engineer could of been some type of new plasma etc. type gun so it was hard to tell. But in this its going to be lots of guns :S .
If you think about it it is like a film set today with muskets and old fashioned rifles with a few bits of tech stuck on :S .
Dont forget there is other cool inventions that may come to light such as microwave guns particle accelerators. And nano tech involved with the bullets...smart bullets? And on the other side of the argument alien 2 had guns and bullets and was pretty cool...but yes not so real. And it was made in a time where realism was harder and effects not so great so iron man suits would probably look a bit naff. ill pray to the film god they have put some more human tech in this one :S ! so they could have created a team of military robots to protect humans. They would be effective and non-infectable against aliens, in addition to Walter. Alien Resurection tells us about the Walmart company that became dominant on Weyland-Yutani thanks to a war fortune. This may mean new unknown technologies, weapons, spacecraft, planets, minerals etc. and contact with other extraterrestrials race, good extraterrestrials, a human / extraterrestrial alliance to eliminate the xenomorph? ! aussi ils auraient pu nous créé une équipe de robots militaire pour protéger les humains. Ils seraient efficace et non infectable face aux aliens, en plus de Walter. Alien resurection nous parle de la société Walmart qui est devenu dominante sur Weyland-Yutani grâce à une fortune de guerre . Cela veut peut-être dire de nouvelle technologies inconnue, des armes, des vaisseaux spatiaux , des planètes, des minerai etc ..
et des contacts avec d'autre race extraterrestre ,de bon extraterrestres , une alliance humain / extraterrestre pour eliminer les xenomorph ?! I am impressed with the blood, it looks so real! I don't think it's so far-fetched that the Covenant crew has "old" weapons tech, after all, in Aliens Hicks has his Ithaca 37 shotgun, Frost and Gorman are seen prominently wielding H&K VP70 pistols and Vasquez has a Smith & Wesson 39 pistol. I am in agreement with all of the concerns posted about why a colony ship 136 years in the future is still using gas driven carbine weapons systems: Aka the M4 modified M16 stemming from a war in the 1960s. So in actuality it is almost 200 years later. I agree after this amount of time there would be major weapons advancements. So let us all dissect this a bit further. First thing to consider: From the prologue in Alien Covenant David communicated everything that happened on LV-223 back to the Weyland Corporation. All of the weapons systems employed by the Prometheus crew were ineffective against the Engineer, Dr. Holloways' mutated form, and the trilobite creature that Dr. Shaw encounters after having it surgically removed from her womb. The trilobite even kills the Engineer. Second we must also postulate that David has communicated this information to the Weyland corporate executives by way of the Prometheus “life boat”. In this communication he must have given highly detailed information about the crews encounters and the weapons employed. Thirdly the Engineers have technology that is 10,000 years more advanced than our human technology. For example space ships that can travel though out our galaxy. Sleep chambers that allow Engineers to hibernate for 2000 years or more. Obviously they have very advanced bio-technology capabilities. Fourth, we all know that despite all these limitations that the Weyland Corporation sends 2000 of these colonists, with what are essentially almost 200 year old gunpowder based weapons to fight highly advanced alien beings. So is this a strategy of the Corporation to ensure they collect the alien? Has this all been designed to fail from the start for the crew and colonists? In the trailer where Walter is out with the expedition crew he stands there doing nothing as another proto-morph is jumping out of the throat of one of the crew members. He does absolutely nothing. He stands there as if nothing is happening at all. That should be a big clue as to what is really going on with all the intentions of Walter and the Weyland executives. Also, just to keep things in the correct context, we have to understand that if they landed and had weapons that were too powerful the crew could easily kill all these different Aliens and there would be no action or point in making a movie just about this type of plot. Another thing to consider is that the audience may not be able to understand or care about all the factual details of a plot they do not understand at the level we do. In addition to all of this we still must consider that chemical based weapons cannot be affected by EMP fields and so as being analog and mechanical they are more reliable under a broader range of conditions. Highly complicated specialized weapons may not be repairable, replaced or more importantly be used because the highly dense energy they require cannot be 3D-printed and synthesized fast enough from ground based productions. I think we would have had a better movie if in Prometheus Peter Weyland commands David and crew to capture the Engineer in stasis. It is conceivable David could have learned about the ship and its computers to keep the Engineer in suspended animation and then take the entire Ship back to Earth. However, Ridley Scott likes to make movies that appeal to the widest range of audience members and does not like to stray too far from formulaic plots. Of course we know that Mr. Weyland would have captured that ship and its Engineer and gone back into hyper sleep himself for the return journey back to Earth. We can all debate these inconsistencies in plot, aesthetics, and what audiences can relate to but I do not think it really matters much because the general public is paying to watch this kind of production, so no real critical thinking comes into play. Great movies from years ago made audiences think more critically about how everything in the film relates to plot because they did not have the type of special effects that we have today. Contemporary younger mainstream audiences are pervasively connected to the larger social networks of the Internet and thus are reading far less than previous generations. Audiences today are not as good at critical thinking which is essential for understanding and developing anything of real substance. Ridley is obviously a visual producer and weighs more heavily on how a movie looks as to how well the plot functions. He got lucky with Alien. I think he did not consult or try to employ enough expertise from science fiction writers to put this all together more convincingly in Alien Covenant. Ridley is not a great science fiction writer and never will be. He is a director-producer and this is what we see in his films. Well respected film critics have been vocal about this in the past so there is no changing it now. I still think the movie is worth watching if for nothing more than the great visual effects because I like to think in the same way as a painter, and also as someone that appreciates masterful design through art. As for the general audience suspension of disbelief comes at a cheaper price. Just know that all of you require much more in order to be convinced by these types of thematic illusions. Yes, they were indeed laser pistols in ALIEN, the script and an interview with R. Scott confirmed such. They didn't want to use them as they didn't want to blast a wound into the adult Alien and have an extremely large hole burned through the ship and out through the hull. remember how little the facehugger bled and what that small amount did? Imagine blasting an Alien and having it bleed about a 1/2 liter of that acid?